Delhi University (DU) invited online applications for recruitment to various teaching posts of Professor, Associate Professor & Assistant Professor. Eligible and interested candidates can apply online latest by 03 June 2015 or within two weeks from the date of publication of the advertisement in the Employment News whichever is later. Persons with disability would have option to apply in offline. 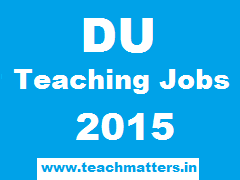 Candidates can apply online at Delhi University's official website i.e. http://work.du.ac.in/du. For more information regarding Essential Qualifications, Reservation, Selection Process and other useful info visit offcial website of DU i.e http://www.du.ac.in.